Paul Giamatti (l.) and Alex Shaffer sit one out in Win Win. 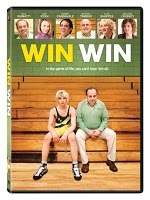 Win Win is a sensitive independent drama-comedy in the guise of a stand-up-and-cheer sports film. Paul Giamatti (Barney’s Version) stars as Mike Flaherty, a struggling lawyer and losing high school wrestling coach. He assumes guardianship of one of his elderly clients (Burt Young, Once Upon a Time in America) and unexpectedly inherits custody of the man’s troubled great-grandson Kyle (Alex Shaffer). By coincidence, Kyle is a talented wrestler who, under Mike’s care, begins to put his life back on track… until Kyle’s neglectful mother (Melanie Lynskey, The Informant!) reappears and threatens to break the bond Kyle has formed with Mike, his family and his fellow wrestlers. Writer/director Tom McCarthy (The Visitor) has fashioned a heartwarming drama that plays to both the art-film and feel-good audiences by crafting well-rounded characters and avoiding Hollywood cliches. A lion’s share of credit is due to the seasoned cast, led by Giamatti, Amy Ryan (an Oscar nominee for Gone Baby Gone), Jeffrey Tambor (TV’s Arrested Development) and newcomer Shaffer (himself a high school wrestler). If Win Win has any failings, it’s the film’s middle-of-the-road nature, not being enough of either artsy drama or sports movie to leave a strong impression on the audience. But films as well-crafted and acted as this are scarce, making the purchase of Win Win a no-lose proposition. Among the more quirky special features is a video portrait of one of the film’s young supporting players experiencing his first taste of fame: “David Thompson at Sundance 2011.” Thompson plays an awkward wrestler who draws inspiration from Kyle’s struggles. At less than three minutes in length, the also-included on-camera interview with McCarthy and Giamatti allows the director and actor to say very little about the making of the film. More enlightening is the interview with McCarthy and co-writer Joe Tiboni (a lawyer in New Providence, N.J.), which reveals the autobiographical underpinnings of the screenplay. Asa Kendall Jr. is a freelance writer in Atlanta. His DVD reviews have appeared on the Turner Classic Movies website.